I’m a lucky lady-in a few weeks we’re taking a family cruise vacation and our boy’s godparents are joining us. We were visiting them this past weekend and their godmother and I were talking about how we were each ramping up the diet and exercise in preparation for all that bathing suit time. She shared with me a delicious crustless skinny apple pie recipe and with her permission I get to share it with you today! It’s perfect for satisfying that sweet tooth without gorging in calories-each serving is just 50 calories! Core and dice apples into 1/2″ cubes. 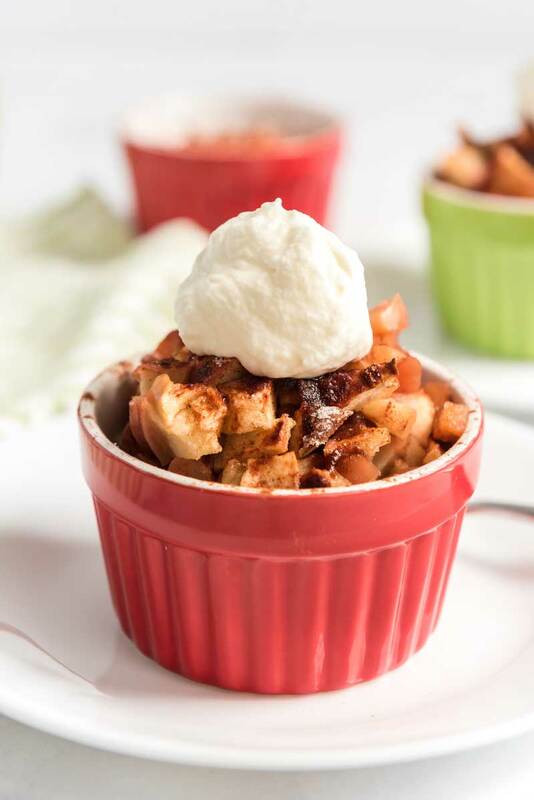 Fill 6 ramekins half full of apple pieces, sprinkle generously with cinnamon. Fill remainder of ramekin with apple pieces, sprinkle again with cinnamon and 1/2 tsp sugar per ramekin. 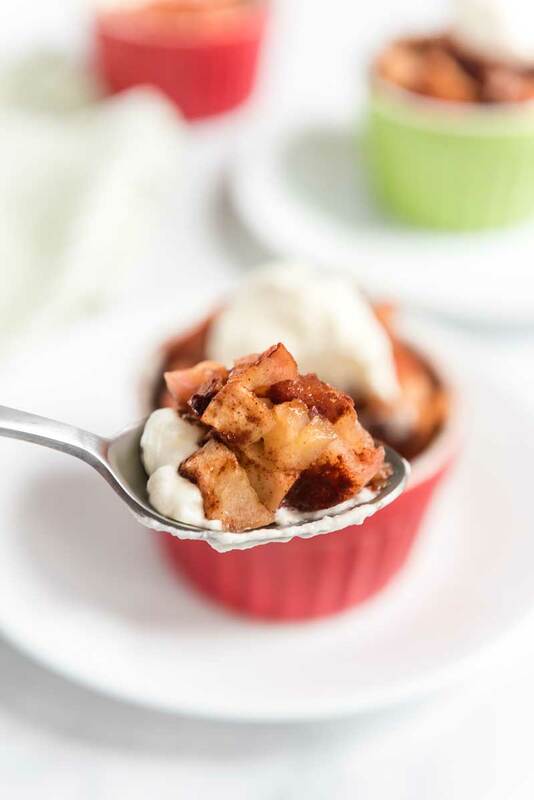 Place ramekins on baking sheet and bake for 35 minutes or until apples are soft. Serve warm-it tastes delicious all on it’s own or for an extra indulgence top with fat free whipped cream or vanilla ice cream! You can totally make this all in one dish but I like to have the ready-made serving sizes that the ramekins offer. By the online calculators I found this was only 1 Weight Watchers Points Plus-so it’s a great option and perfect for fall! This looks delicious! I am totally pinning this and making this the next time we have icecream! It’s fantastic Trine-I hope you like it as much as I do! What size Ramekins do you use? 9oz? Anyone happen to know the calorie count?